Arms folded, Paolo Zambrano considers a plate of ribs. The sun is high overhead. It is early January. Every few minutes, another airliner lifts off at San Francisco International Airport (SFO). We are at the Northern California food lab of Flying Food Group, in an industrial section of town, facing the bay. An attentive group of airline and catering-company executives, chefs, number crunchers and kitchen managers follow the intensely focused Zambrano, manager of in-flight services for Singapore Airlines, as he circles a U-shaped set of tables on which dozens of dishes, presented on ceramic or aluminum trays, wait to be judged. 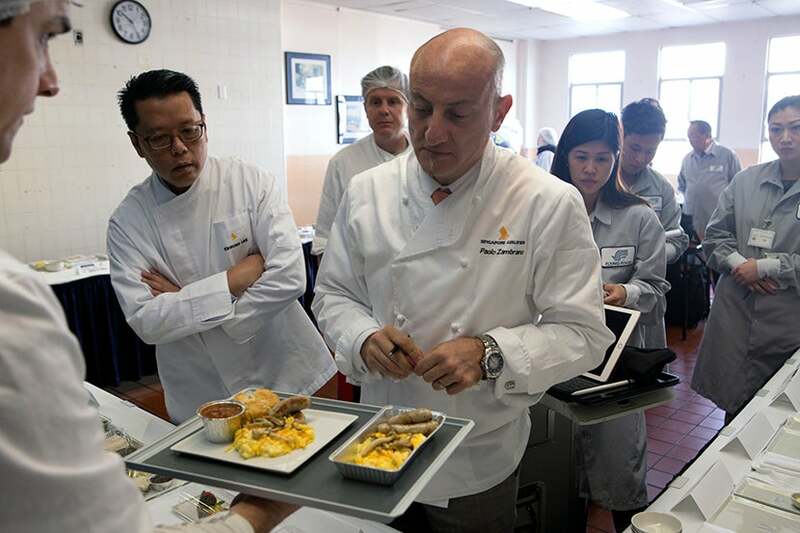 Paolo Zambrano tests a potential meal for a future Singapore Airlines menu as a retinue of assistants, airline officials, chefs and accountants takes notes. Image by the author. Does the Food Look Good? Today’s list of menu items is 36 pages long. Concoctions range from flaxseed waffles to dim sum yam cake to ricotta cheesecake with brioche croutons to steamed sea striped bass with black bean sauce. By late summer, most of these dishes will be featured on the menu for Singapore’s Asia-bound routes. Zambrano, a compact, soft-spoken and steely-eyed fellow with a ginger-colored soul patch, stops and ponders each plate before issuing a remark to the group, which scrambles to take notes or punch figures into computer tablets. Sometimes a chef removes a plate and scurries behind the curtain to the kitchen, returning with a different side dish or altered ingredient minutes later. Zambrano doesn’t taste anything — not yet. This is day one of many, and the singular goal is to assess how the food looks on the plate. Will the mushrooms be too soggy? Will the eggs appear rubbery? Most importantly, will it all look good enough to eat? After a serious 20 minutes, Zambrano asks what I think of a small stack of mahogany-colored, generously sauced St. Louis-style ribs, presented like a teepee on the plate and fragrant with the smell of brown sugar and citrus peel. The ribs are Instagrammably attractive. The toothsome hunks of meat are slathered in an auburn sauce and fall-off-the-bone tender. But there’s something wrong: They are too sweet. Airline chefs must trick the mind into tasting the salt and sugars that it can no longer sense when flying, boosting sweetness through sauces and letting the brain infer saltiness through a clever use of spices. So those St. Louis ribs are covered in a commercial barbecue sauce that would be too sweet at sea level in San Francisco, but in the air, they hit the literal sweet spot of flavor. Back in the 1930s, you were lucky if you got a boxed meal or a sandwich. And given that those initial flights were on small planes flying low-altitude, high-turbulence legs, you were even luckier if you were not too nauseous to eat it. By the late ‘30s, airplanes were equipped with heating-enabled kitchens and could serve fancier stuff like beef tenderloin and stuffed lamb chops. Fast-forward to the 1950s, the heyday of commercial travel. More people were flying and meals were lusciously prepared white-glove events. BOAC Boeing 707 First Class. Photo courtesy of BA. 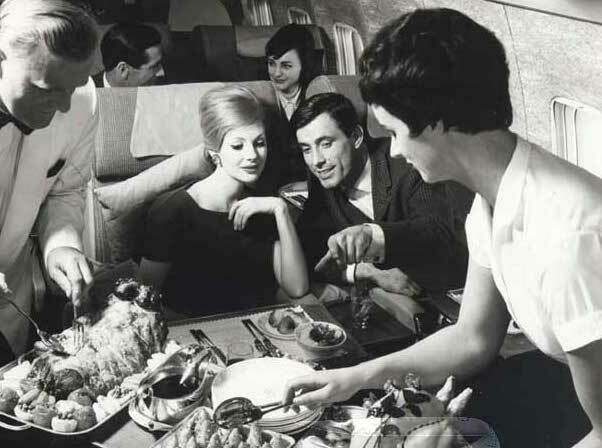 As flying became more affordable and more widespread over the past few decades, restaurant-style service went the way of dirigibles and flight attendants with beehive hairdos. “When you’re flying around on a small aircraft in the fifties, with few people and high prices, that’s one thing, but in the era of mass travel, restaurant-quality dining becomes much harder to do,” says Jamie Perry, Vice President of Marketing for JetBlue. Efforts to reform airline food at the end of the 20th century were set back with the terrorist attacks of Sept. 11, 2001, which forever changed the way the world flew, and eliminated features that travelers had taken for granted, such as metal forks and knives. The world went into a recession and airlines struggled to come out ahead. Food, really just a perk, could be scaled back. Only nine days after the Twin Towers fell, American Airlines and TWA said they were getting rid of economy meals on domestic flights and in first-class flights of less than two hours. Northwest and Delta followed suit within weeks. In 2003, American ended its free snacks in the main cabin. US Airways did the same five years later. Gone was the promise of fine dining in the sky. Suddenly you were lucky to nab a pack of peanuts. Now that globalism has increased the volume of air traffic — 3.6 billion passengers flew globally in 2016 — airlines are tinkering again with palate-pleasing meals. American and Delta recently announced that they’ll be reintroducing free meals for economy passengers on certain domestic flights. All three major US airlines have also returned to offering free snacks in the main cabin. In any case, the message airlines want to send is clear: Airline food isn’t going to be the laughingstock of the culinary world anymore. And, of course, a sizable number of people use loyalty programs to upgrade to better seats in business or first class — which means more courses (a glass of Champagne after being seated), better food (and more choices), real silverware and premium wine/beer/cocktails. To revitalize their food, airlines first had to reconstruct the fundamentals of a meal. That meant figuring out not only how to make food taste better at high altitudes, but how human brains perceive what they eat in the first place. We don’t just taste with our mouths. “Taste” is actually olfactory: We mostly smell what we eat and interpret that as flavor. Researchers have found that by blocking the sense of smell, they can cripple your sense of taste. “Taste” is actually olfactory: We mostly smell what we eat and interpret that as flavor. Can you remember the last time you really enjoyed a meal with a stuffy nose? It turns out that it’s not just smell, but the whole panoply of senses and sensations that help determine whether you enjoy what you’re eating or not, from the visuals on the plate to the heft of the silverware and even what you hear as you’re eating. The flavor of our food is a summation of … taste, smell, temperature, texture, and the sounds the food makes when you consume it. We usually peg the legendary awfulness of airplane food to its taste, but when airlines looked at the data, they found that passengers had the biggest problems with other factors, even when airline food was at its seeming worst. “In the eighties, the complaints were more about what the meals looked like than what they tasted like — and they looked bloody awful,” says JetBlue’s Perry. Yes, sound plays a huge role, too. In 2008, Oxford University experimental psychologist Charles Spence, considered the leader in the field of taste perception and author of Gastrophysics: The New Science of Eating (June 2017), ran a study with his student Max Zampini, in which test subjects eating Pringles rated the potato chips 15% crisper and fresher when the researchers boosted the high-frequency sounds of the crunches. Compare that to the din of an airplane cabin, where you’re nearly deafened by the racket of the engines and your neighbors, or have opted to tune out with earbuds so you can catch up on Walking Dead episodes. Your poor Waldorf salad simply can’t make itself heard, no matter how crispy and fresh it really is. Airlines have since approached Spence about helping develop what he calls “sonic seasoning” — in-flight music channels tailored to enhance the pleasure associated with particular meals. Human beings seem to associate lower-pitched sounds and voices with bitter tastes and high-pitched notes with sweetness. “Louis Armstrong will bring out the bitter notes in a dark-chocolate dessert,” Spence says. Finally, there’s arguably no better — or worse — seasoning than our own emotions. The stress of flying plays a huge role in whether you push your plate away with a smile or a grimace. 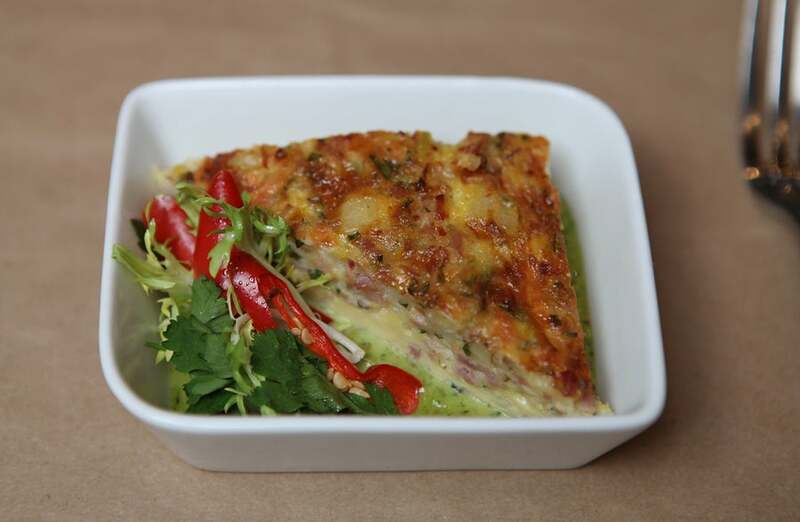 Ham, cheddar and leek frittata. Eggs often prove to be one of the most difficult foods for airlines to work with because it’s difficult to nail the right texture. Image courtesy of John Falls. That said, researchers continue to try and pinpoint which flavors change in airplane-like conditions, and how and why those flavors change. The general consensus, thanks to research done by (former) University of Manchester researcher Andy Woods and his colleagues in 2010, is that two officially recognized tastes are noticeably dulled by the background noise of today’s airplanes: saltiness and sweetness. That’s in addition to the fact that here, on terra firma, our perception of sweetness already seems to vary throughout the course of a day. Another surprise, which Spence discovered in 2014, is that airplane noise, at 80 decibels or higher, actually boosts our sense of umami, that unofficial but widely acknowledged “fifth” taste often described as meatiness or savoriness. Sour and bitter flavors, however, remain unaffected. So consider this: When chefs design menus for passengers, they have to use ingredients they know will dry out quickly, but which still taste great to people who essentially have head colds, who can’t taste saltiness or sweetness well and who have to eat in a cramped room full of grumpy strangers and loud whirring machinery. The limitations of in-flight meals don’t impede serious chefs from experimenting their way to good, altitude-stable flavors. They do need patience. “It takes about six to eight months to fully design and implement a menu,” says Jeff Pelch, senior manager of product strategy and implementation for the United Airlines food-service department. From concept to roll-out, that’s some high-volume experimenting. United’s new Polaris menu, which launched Dec. 1, 2016, included 28 menu workshops in 16 cities on five continents to produce 48 new salads, 96 appetizers and 240 entrees. Even after narrowing down possibilities, the airline rolled out 1,906 new food and beverage items to passengers, including more than 500 for breakfast alone. Adjusting for regional and cultural food preferences on hundreds of flights daily, on different routes around the globe, is no small feat. 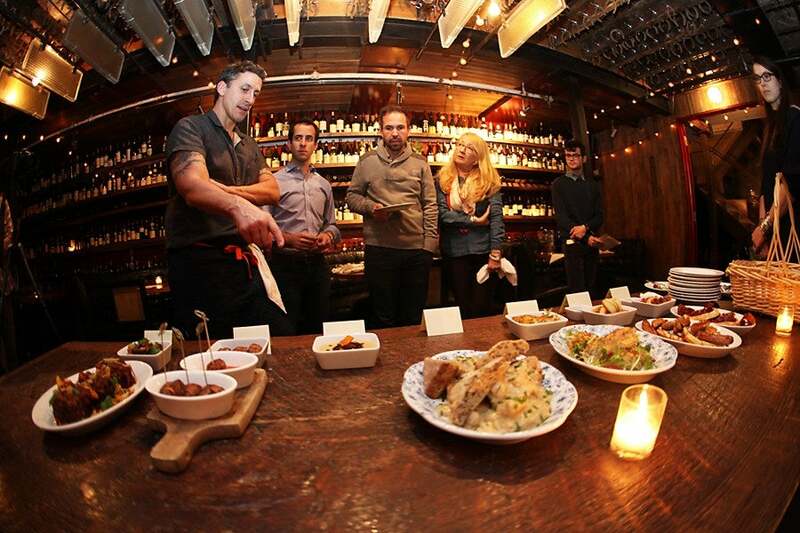 Farmerie (left) leads JetBlue officials and consultants on a tour of his proposed Mint menus. Image courtesy of John Falls. Sometimes airlines assign chefs to specific routes — Singapore Airlines, for example, splits certain West Coast routes between California-based James Beard Award-winners Suzanne Goin and Alfred Portale. In an effort to appeal to trendy locavore types, many airlines emphasize dishes and ingredients sourced near the departing airport. By necessity, food has always been sourced locally. But as the locavore movement got traction and became fashionable among foodies, airlines caught on and hired chefs known for sourcing locally to develop their menus. “We added what local chefs suggested, regional specialties utilizing what is fresh in locally — lamb from Ireland, cottage pie out of England, coq au vin out of France,” says United chef Gerry McLoughlin. Read our interview with celebrity chef Joël Robuchon — who has amassed 31 Michelin stars in his career and who helped develop Air France’s long-haul La Première menu. 30 or 40 years ago, Perry explains, the fix for people’s diminished sense of taste would be to pile on the salt — neither healthy nor cost-effective. Now, to make up for that loss in moisture, chefs design menus to emphasize ingredients that can hold up longer. This explains the attention to detail for the barbecue sauce on the St. Louis-style ribs, which serves as a moisture shield for the meat on the ribs. Even the choice of meat is guided by the need to retain moisture — rich, fatty cuts read as tender and moist to the tongue much longer than, say, chicken breast, which is notorious for becoming desiccated and unpleasant in the air without saucing. You’ll see similar moisture infusions in almost any airline’s culinary offerings: On the JetBlue Mint menu, the waffles with chicken sausage — one of the most popular items — works because the maple syrup blankets the rest of the dish with moisture. On United Asian routes, the Thai chicken uses a coconut-ginger sauce. Coconut milk plays a key role in the appeal of Singapore’s nasi lemak rice dish, while its popular lobster Thermidor relies on butter, brandy and a creamy mushroom sauce. 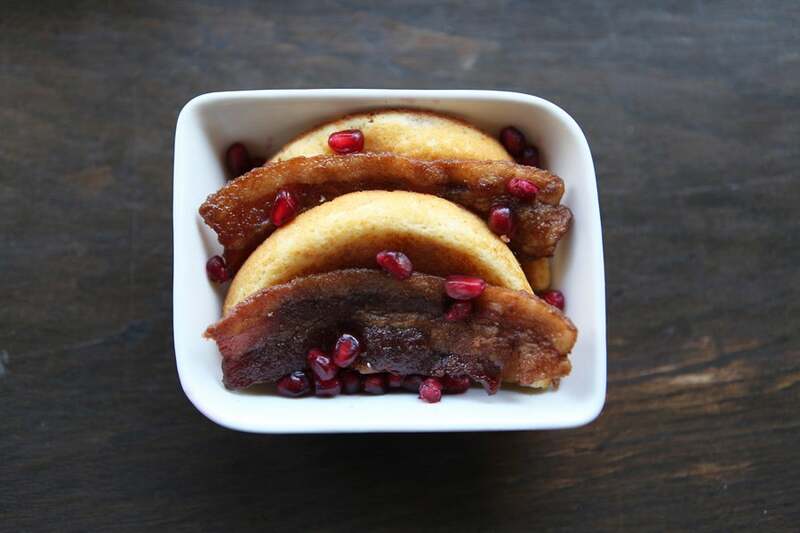 Pancakes, pomegranate seeds and maple glazed bacon. Using syrup to keep meals from drying out is a time-honored trick of the airline-food trade. Image courtesy of John Falls. Airline kitchens are also turning to newer cooking techniques to prep more tender dishes with flavorful marinades. A favorite for this is sous vide, in which food is vacuum-sealed with a marinade in a plastic bag and then cooked over a low temperature that turns the meat tender and flavorful. Chefs have also learned to avoid certain pitfalls and problem foods when they’re designing airline menus. Bread goes stale fast at altitude, and unless it’s a necessary part of a sandwich, airline chefs generally try to serve bread only when it’s just out of the oven. You’ll rarely find French fries on an airplane menu because fried foods become impossibly mushy. Mineral-heavy wines taste less like slate and more like plain old dirt among the clouds — that’s why onboard wine lists favor sweeter, fruitier options. Cruciferous vegetables such as broccoli give off an unpleasant odor as they’re reheated, which is relatively minor detail when you can open a window but another thing when you’re in a sealed aluminum tube with 400 other people. And speaking of unpleasant gasses, cruciferous veggies and beans tend to make people flatulent, which no one wants, so you’ll generally see them used in moderation, if at all, in airline meals. Still, even with everything airlines have learned, there can be missteps. Taking perhaps the wrong lesson from the Spence study about increased umami levels, Virgin Australia served passengers on its Perth-to-Adelaide route Parmesan sandwiches on Christmas Day last year, thinking that the cheese’s inherent savoriness would be an extraordinary treat in the air. Unfortunately, the odor from the cheese — which one witness described as “old socks” — quickly filled the cabin and made passengers who didn’t order the sandwiches gag and vomit. “It was sweaty socks their brains were telling them they were smelling, not pressed Parmesan sandwiches,” Spence says. No matter how a good a menu’s lineup tastes, a financial audit takes place before it can become a reality. An airline accountant goes through each dish ingredient by ingredient, calculating the bottom line. At the Singapore Airlines taste test in San Francisco, the accountant on hand meticulously input numbers into a spreadsheet on a laptop as Zambrano made his circuit around the room, instantly assessing whether an extra radish, another 10 milligrams of salad dressing or subbing granola for muesli might send the menu’s budget into the red. That’s no exaggeration: Seemingly tiny changes to meals can result in losses or savings of millions. In 2011, for example, The New York Times reported how Delta could have saved $500,000 each year with one simple change to its food and beverage procedures — by slicing limes into 16 slices instead of 10. Once a menu is decided — after multiple rounds of concept menus, taste-testing and number-crunching — it becomes the airline caterers’ jobs to turn those concepts into meals. You’d think airline meals are frozen, but no, they’re almost always made fresh at or near the departure airport — and within 24 hours or less before takeoff. To save time, money and space, they’re cooked most of the way through on the ground, chilled to a safe temperature, wrapped up, slid onto those familiar narrow airplane carts that run over your foot when you take an aisle seat, and loaded onto a plane. The key is to ensure that meals don’t deteriorate between the time they’re in the kitchen on the ground and the moment when they land on your seat-back tray table. Sometimes the caterers rely on old tricks of the trade, such as using a leaf of lettuce or cabbage to cover and moisten the elements of a meal that dry out quickly. Other times, they use advances in culinary technology to tackle the problem. That’s why sous vide cooking, in which food is vacuum-sealed with a marinade in a plastic bag and then cooked over a low temperature that turns the meat tender and flavorful, has become increasingly popular. Space and weight are at a premium on any airplane, so the height of each dish is carefully monitored — a typical airline food tray allows for about an inch and a half of height, so you’re unlikely to find a 1990s-style tower salad on a plane any time soon. Meals also have to be consistent in weight and size both for financial reasons and to ensure that they remain as attractively plated as the chefs intended. The caterers preparing your meals typically work off photographs of what the finished dish is supposed to look like, in a tradition borrowed from restaurant kitchens. “Our chefs strive to entertain the eye as well as the palate, so there’s a focus on contrast, texture and attractive meal plating with colorful fruits and fresh herbs strategically placed,” Zambrano says. 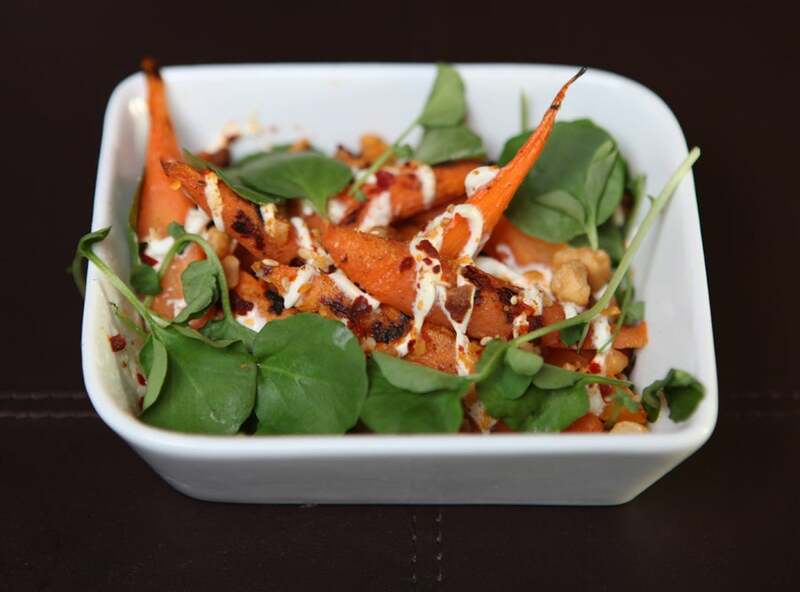 Charred carrots, lemon yogurt and dukkah (a condiment made with herbs, nuts, and spices). We consider colorful and attractive meals to be more satisfying. Image courtesy of John Falls. Once the meals are in the air, the cabin crew are given guidelines as to how long and at what temperature dishes should be heated in the onboard ovens (conventional or convection ovens, never microwaves). Sometimes the instructions are exacting, sometimes less so. One frequently heard instruction is the so-called 1-5-4-5 rule — proteins should be heated up 15 degrees Celsius or for 45 minutes, whichever comes first. At least that’s how it works in theory. Flight attendants may have vastly more leeway in cooking and serving meals once the wheels are up. From menu concept to in-flight service, airline meals are the product of nearly a year’s worth of meticulous planning, culinary creativity, line-by-line budgeting, corporate rollouts, up-to-the-minute sourcing and on-the-spot improvisation by flight attendants. At any moment, it can all go sideways, from when a celebrity chef jots down an idea for a concept menu to a hike in the price of maple syrup to when your flight attendant hands you your rounded-square bowl of fettuccine Alfredo. And yet even the most seasoned traveler can probably recall only a handful of times, if any, that their airline meals went catastrophically wrong. Maybe that’s testament to the ingenuity of the cabin crew and chefs, and to airlines’ newfound respect for the growing science behind eating in the air. Or maybe it’s just easier to remember a great meal rather than another mediocre one.